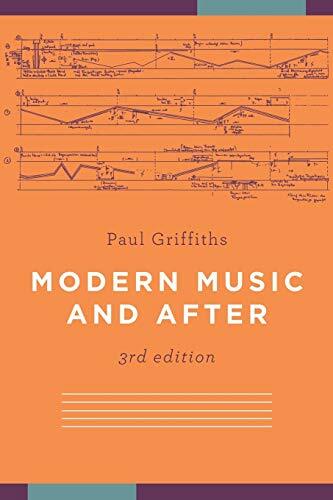 Over three decades, Paul Griffiths’s survey has remained the definitive study of music since the Second World War; this fully revised and updated edition re-establishes Modern Music and After as the preeminent introduction to the music of our time. The disruptions of the war, and the struggles of the ensuing peace, were reflected in the music of the time: in Pierre Boulez’s radical reformation of compositional technique and in John Cage’s development of zen music; in Milton Babbitt’s settling of the serial system and in Dmitry Shostakovich’s unsettling symphonies; in Karlheinz Stockhausen’s development of electronic music and in Luigi Nono’s pursuit of the universally human, in Iannis Xenakis’s view of music as sounding mathematics and in Luciano Berio’s consideration of it as language. The initiatives of these composers and their contemporaries opened prospects that haven’t yet stopped unfolding. This constant expansion of musical thinking since 1945 has left us with no singular history of music; Griffiths’s study accordingly follows several different paths, showing how and why they converge and diverge. This new edition of Modern Music and After discusses not only the music of the fifteen years that have passed since the previous edition, but also the recent explosion of scholarly interest in the latter half of the twentieth century. In particular, the book has been expanded to incorporate the variety of responses to the modernist impasse experienced by composers of the 1980s and 1990s. Griffiths then moves the book into the twenty-first century as he examines such highly influential composers as Helmut Lachenmann and Salvatore Sciarrino. For its breadth, wealth of detail, and characteristic wit and clarity, the third edition of Modern Music and After is required reading for the student and the enquiring listener.